So you’ve settled into your villa, spent a few lazy days around the pool, brought your sleep quota up to speed and overindulged on the Mythos and delicious local food. Some of you may be happy to continue in this fashion for the rest of your holiday, and why not? However, some of you may have itchy feet, fidgety fingers and, well, a need to just DO something! If that’s the case then why not join the Walking Rhodes team for a day out. Stretch your legs, see some parts of Rhodes most locals don’t even know about and just soak up some of the islands outstanding natural beauty. Myself and Anni were invited by Walking Rhodes to join them on a coastal walk. We were promised stunning scenery, beautiful flora and fauna and a few (pleasant) surprises on the way. We set off from Archangelos on a bright spring morning and comfortably followed a winding dirt road that lead out of the village and through olive groves with sheep wandering and grazing on the fragrant foliage in between the trees. It wasn’t long before we caught our first glimpse of the shimmering Mediterranean, framed between the rough rock of the surrounding mountains. We ooh-ed and ah-ed at the delicate spring flowers, so randomly sprouting out of rocks and in-between stones. Spring is a wonderful time anywhere, but in Rhodes it’s a true wonder as over the next six months the blazing sun will slowly turn the green pastures golden, then brown. Our walk was classed as ‘moderate’ in the difficulty scale used to describe the walks. Although we were enjoying a slightly abridged version of this coastal walk (making it shorter) the walk was still given this classification due to the terrain we would cover. A moderate walk usually means it’s longer than an easy walk, or the rating may be given to indicate that the route traverses through stony or rocky areas. Soon after we turned off our dirt road we were deftly picking our way through rougher ground and climbing up and over a few rocks. If I had been walking alone or with non-walking company I would have turned back here, not knowing what lay ahead and if the area was passable. And this was the joy of being guided by Richard, our Walking Rhodes guide. We talked about the local history; he pointed out places of interest along the beautiful coastline and always informed us of what to look out for and where to put our feet. The pace was completely dictated by us and we stopped many times to take photos, look up wild flowers in Richards’s book and just to take in the views. Our walk took two and half hours, enough for me who’s usual exercise is walking up the stairs to the office, but not too much so that I felt exhausted at the end of it! One of the most surprising things we came across was a stone quarry, probably dating back to the 14th century. It’s thought that blocks of the sand stone were cut out from here and used to build the castle. There is no road either way to the quarry, so the blocks must have been transported by donkey or by lowering them down the rock face to a boat below. As we came off the mountain onto a flat pasture we were greeted by the picture postcard perfect view of Agathi Beach with the ruins of the medieval castle of Fereklos perched high above. Just before we descended to the beach Richard pointed out some random, oblong holes dug into the ground. Somewhere over a metre long and about 60 cms wide, a couple where smaller, approximately 60 cm long and perhaps 30cm wide. Not much is known about their origin; they were recently excavated by the archaeological society and were thought to be children’s graves. Richard couldn’t tell me much more about them as he hadn’t been able to find out. Well we all love a mystery don’t we! I was totally intrigued and felt a morbid fascination as to why children would have been buried here, why the graves where so randomly spaced. What if they weren’t graves at all, but buried treasure from the Knights of St John in a desperate attempt to hide their valuables from the approaching Ottomans? Below the site of the graves and dug out into the rock is the little church of St Agatha, built between the 14th and 15th century. Once again, the ground under our feet changes as we stride out over the soft, giving sands of Agathi beach. The sea looks so inviting and sparkles in the sunlight, tempting. During summer the beach is laid out with sunbeds and umbrellas and several mobile cafes invitingly offer ice creams and cold beers. Missing out on a cold beer seems a small price to play to see the beach in its natural state. Well, a fairly small price. And there we complete our walk, enjoying a sandwich on a grassy knoll with the majestic castle on one side and the idyllic beach on the other. We are able to look over to where we have just walked and I am amazed. We sit quietly, reflecting, recovering. It’s been a wonderful morning, a reminder of the incredible natural beauty surrounding us. A chance to contemplate, let thoughts flow uninterrupted and get some perspective back. I feel energised, empowered and just damn good! The view to the left…. ‘Elizabeth, please stand back from the edge’ ! Should have written down the name! graves – or treasure holes? ‘Walking Rhodes‘ is a registered company who offer guided walks in Rhodes for walkers of all ability and agility levels. They offer a variety of walks around the island either coastal, mountain or forest. 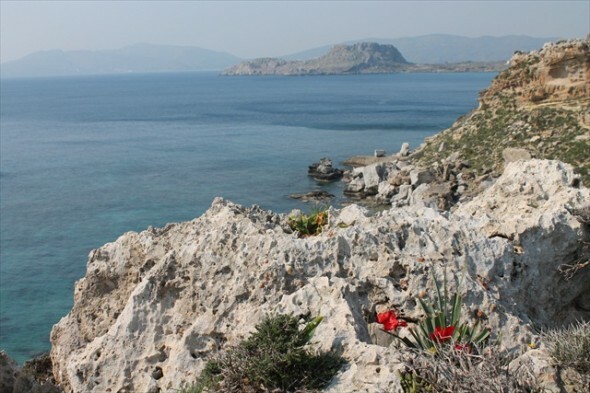 Our walk was the coastal walk from Tsambika beach to Agathi, however we started in Archangelos giving us a shorter walk to suit our walking level which just goes to demonstrate the wonderful accommodating and friendly nature of the company! You can see detailed descriptions of all the walks on their website or from the leaflets in all our Rhodes villas. Prices start from 35 euros per person (not including transportation to the start of the walk). The walks can be booked through the website before your arrival or when you are in Rhodes. This is just right for my friends and I in September 2012 we all look forward to our hol. and cant wait. Thanks Pat! Glad you liked it. It was certainly a day that made me appreciate the natural beauty of Rhodes and be thankful for the wonderful job I have!